In my imagination, I’d love to live on a farm. I say “in my imagination” because, in my reality, I’m actually the farthest thing from a farm type of gal (“What the-? What do you mean, 5:15 is the normal time for the rooster to crow?! !” OR, “What do you mean, it’s almost 2 hours to the closest Barnes and Noble?” OR, “What do you mean, ‘that’s just what manure smells like, so get used to it’???!!!”). Um, nope, I don’t think so. Still, in my fantasy, I’m a latter day Lisa Douglas. Mid-afternoon, I turn to my HH Wendell Douglas and casually remark, “Oh, dahlink, what shall we have for dinner tonight? I think I vill go out back to our vegetable patch and pick something fresh.” And then I cook it and we eat it and it’s delicious, of course. Well, now that it’s finally beginning to look a lot like Christmas hockey season reruns springtime here in Toronto, all the gardeners are out on our street. Our neighbours across the way have been scattering a wheelbarrow full of rich, black composted soil over their front lawn. Everywhere I look, I see women on their knees yanking weeds out of the flower garden, others pulling up dried-out webs of branches and roots. As far as I could tell until yesterday, what remained in our garden was one puffy green bush near the tree in the front yard, some teeny purple flowers (or were they weeds?) and a few long, sharp green plants that look like miniature palm trees. What they are called, or what they will sprout, I’m afraid I have no idea. My one and only previous gardening experience involves a single jalapeno seedling (I chose a jalapeno because I guessed it would require no maintenance, would self-repel bugs and raccoons, and would yield a small enough harvest that I could use it all up before it began to rot). I was correct on most counts, though the plant, remarkably, flourished and the HH and I ended up eating jalapenos in every imaginable food, from scrambled eggs to pesto to muffins to plain ole roasted in a pan. But at least it proved I could grow a plant without killing it (or neglecting it to the point of killing it). This year, I vowed, I’d venture into something a bit more exotic. My friend Gemini I (a gardener extraordinaire) has promised that herbs are fairly easy to grow, so I figured I’d plant some basil, cilantro, dill and sage. Then, yesterday, I was strolling past the side of our house on my way toward the back yard for some Frisbee-toss with The Girls and noticed something odd. There, spanning the entire length of the house, was a patch of earth the previous tenants had evidently forgotten–completely covered in small, green, leafy, plants in full bloom. They were a dazzling, almost translucent shade of green, lighter than grass but deeper than lime. . . the color reminded me of something, but what? It was sort of like. . . the color of. . . the color of mint. Yes, mint! And I’ll be darned, when I bent over and pinched one of those verdant babies between my fingers, that’s exactly what they smelled like. “Oh, that’s mint,” my next-door neighbour said as she sauntered over to me and The Patch. Wow. And so, without even a modicum of effort, I now am the proud owner of a fully formed, instant mint garden. But what to do with it? “Want some?” I asked her. I am still planning to plant the cilantro and basil, as I can never get enough of either. But I have to admit that, much as I enjoy mint as a flavoring, I’ve never really been forced to make use of this much of it before. Something tells me I’ll be drinking my share of mint juleps over the next few months–though, even once I’ve given much away to friends and colleagues, I’ll still have more mint than could possibly be consumed even by Daisy and Tom and Jordan and Gatsby during a long, hot, humid summer. (I see much green in my future: chocolate-mint cookies, mint smoothies, mint ice creams, mint salads and all manner of mint drinks, alcoholic and otherwise. . . ). 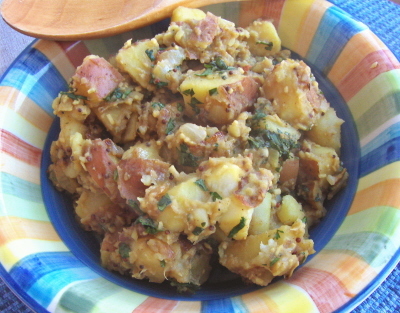 We had planned to have a favorite Indian-spiced potato dish called Aloo Masala, but the recipe didn’t call for any mint. No matter; I threw some in anyway. Along with the complement of other spices, it made for a delightful, slightly sweet and slightly peppery bowl of spuds. The HH had these with an organic chicken breast (on which he piled even more mint), while I was happy with a simple bowl on its own. Well, that took care of about 1/85th of our mint. Any suggestions for tomorrow? These potatoes come together very quickly and offer a spicy, smooth and comforting side dish to pretty much any main. Cook the potatoes in just enough water to cover with half the onion, the turmeric and the chilies until about half cooked, about 8 minutes [note: next time I do these, I will omit the onion here and simply fry it all together at the end–I think the potatoes would have a better flavor that way, infused with the caramelized onion]. Meanwhile, blend the garam masala, coconut and ginger in a coffee grinder or miniature food processor. Add to the potato and continue to cook for a further 8 minutes, until tender but not soft, and most of the water has evaporated. Heat the oil in a skillet and add the mustard seeds. Let them sizzle for a few seconds until they have popped, then add the onion and fry until deep golden brown. Stir this into the curry in the pot. Add salt to taste and sprinkle with the mint and cilantro. Makes 4 servings. Good luck with your gardening adventure! I couldn’t imagine our backyard in the summer without the bursting beauty of fresh herbs and veggies. We even have a few apple trees for applesauce. But I agree, it would be amazing to live on a farm and produce everything you eat… funny how mindsets change over time. I had this conversation with my mother earlier today. It was once thought that gardeners were lower class and it was more prestigious to do better things with your time. Now everyone is concerned about where their food comes from (and rightly so). That said, your curry is beautiful. My mother is very much into trying new spices and she would love this, thanks! I love gardens!!! theres nothing better than fresh vegetables… my fav is fresh basil… theres nothing like it. Your curry is beautiful. I never seem to be able to get indian food just right… by the looks of it.. you certainly did! As for using mint – my mum always made mint sauce for lamb but I have enjoyed it more with pasta, dips, soups, and salads – and am envious of your bounty for my mint plant has died right back! You need mint to make tabouli! Yum! It won’t look as good as your aloo masala, but I would make mint tee. Cut a bunch, throw it in boiling water, and voila! I enjoy this very much! Yeah, I don’t use a lot of mint. Basil and coriander are my favourites, but I think I’d need a pretty big field of coriander plants to keep up with how much I actually use! I am the same way! Want to buy an imaginary farm with me? Good luck with the rest of the mint. At my house, we’ve been trying to use up our plethora of fresh basil. Ha ha ha ha…herbs may be “easy” to grow, but I have managed to kill far more than my share over the past two summers! In my defense, I live in an apt in the city so they were just little potted herbs that I put in my windowsill, but still…I have decided I do NOT have my mother’s green thumb! And this year, rather than throwing my money away and buying herb plants (and then more when those die, and more when those die…) I am just going to frequent the farmers market and buy THEIR freshly grown herbs! Good luck with your basil and cilantro–those are two of my favorites too! You could make iced mint tea with your mint! It is so cool and refreshing in the summer–yum! And you could dry some of it to make hot tea in the winter/fall too. It is also really good in fresh fruit salads! I enjoyed your “mint” story. How dreadful that all the plants were taken though. Usually that has to be specified on the sales agreement. Glad you are planting some herbs. THANKS, EVERYONE, for your mint suggestions!! They all sound appealing to me and I look forward to trying them out! You’re so right about the impression of farmers having changed. And it’s such a shame that so few people are really doing this now! I think I’d be happy growing just a few things in our yard–it would be so cool to make pasta sauce with my “own” tomatoes! Hope your mom enjoys the curry–and tell her I send along a “You go, Girl!” in admiration of her vegan diet experiment! I know what you mean about gardens vs. baking–I can always figure out why the latter didn’t work. Years ago I got a cactus as a gift and believe it or not, IT DIED! I have no idea what I did! Wish I could send some of this lovely mint your way. . .
Great idea! I’m going to see if I can think of a sub for the (wheat) bulgur and do one up! I’ve always done what you do in the past, and just bought them at the farmers’ market. But there was this whole backyard with patches of earth just waiting to have things planted in them. . . . Oh, and iced mint tea sounds fabulous (I think I really will look up the recipe for mint juleps, too). And why didn’t I think to dry the stuff?? It’s easy to do, and then I can use it throughout the year, as you suggest. Thanks! I’ve heard that from some of my friends. I’d say it’s about halfway there already, having completely filled the patch of earth that runs along the side of the house! I know, it was pretty shocking! But they (like us) were tenants, so I guess they figured they could take anything they’d bought away with them! The landlord didn’t seem to mind too much, either, and hasn’t done anything about the gaping holes yet. 🙁 But I am really looking forward to watching the herbs take root and grow. That is a pretty poor show! Surely they could have taken cuttings with them! Well done to you for starting your own garden. I don’t use an awful lot of mint, but I love the smell of it! Your Aloo Masala looks so delicious! Good luck with the gardening. Watch out for mint, it will take over! Mmmm…now that I’ve left the wasteland of Philadelphia I hope to grow an herb garden this summer. We seem to have, again, parallel experiences: last year I succeeded in growing hot peppers and a bit of basil in my windowsill, and at my father’s house we always harvested mint like the plants were weeds. A friend grew a “mojito garden” with four kinds of mint for summer beverages! Mint leaves are great in peach sangria or lemonade. And I like bits of mint in a marinated fruit salad. Can’t wait to see what you come up with! I love Indian dishes (isn’t “aloo” just so fun to say?) This sounds amazing, of course. Well, I guess some people just have no manners 😉 . And I suppose that if I don’t find uses for all the mint, I can use it as an air freshener! Thanks for the warning. A few people have mentioned this, which makes me a bit wary of the mint! The aloo masala looks delicious! I like how it’s all mixed up with itself. If that makes any sense. 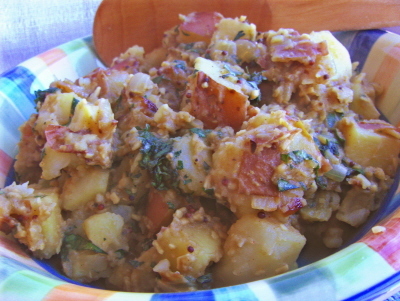 I am such a huge fan of Amy’s Indian meals – now I can make my own potatoes!